You May Never Have Thought About Food As Medicine, But It Is...Here's Why.Banana Nutrition: Traditional Chinese Medicine Healing Properties! Banana Nutrition. In Traditional Chinese Medicine Banana is a food with remarkable healing power. Thermically (meaning it has a heating or cooling or neutral effect on the body's temperature): it is very cooling. It strongly cools the body. 2. Moistens the Lungs, treats dry lungs and dry cough. 4. Eliminate toxins from the body. 5. Because of cooling nature and other properties bananas are useful in the treatment of drug addiction especially alcoholism marked by heat signs such as red tongue, face, feelings of heat...and sugar cravings. Acid/Alkaline Producing Effect On The Body: Alkalyzing! To be healthy your body has to be slightly Alkaline. If you don't eat many fruits and vegetables and haven't for a long period of time chances are that your body is very acidic and you are beginning to be sick, if you are not already experiencing degenerative diseases. The excellent banana nutrition facts. Bananas have very high potassium content, a mineral essential to the normal muscle function for both the voluntary muscles (ex. the arms and hands) and the involuntary muscles (ex. the heart and intestines). Potassium also lowers blood pressure. Bananas are a good source of dietary fiber, and are low in saturated fat and cholesterol. This is also one of the few fruits that contains the entire range of B Vitamins including—thiamine (B1), riboflavin (B2), niacin (B3), folic acid (B6) and small quantities of B5 and B12. Compared to an apple, a banana has four times the protein, twice the carbohydrates, three times the phosphorus, five times the vitamin A and iron, and twice all the other vitamins and minerals they have in common. Along with all the above, bananas also contain important and significant amounts of copper (which benefits the blood and retards graying of the hair), chromium, fluoride, manganese, selenium and zinc. It's really an amazing fruit! Anemia: Bananas provide iron which is essential for the production of hemoglobin, myo-globin and many enzymes essential for the formation of red blood cells. Athletic Performance Booster: Bananas contain three natural sugars - sucrose, fructose and glucose combined with fiber. A banana gives an instant, sustained and substantial boost of energy. Research has proven that just two bananas provide enough energy for a strenuous 90-minute workout. No wonder the banana is the number one fruit with the world's leading athletes. Lowers Blood Pressure: A recent study has revealed that "two bananas a day will keep high blood pressure at bay". This is definitely a cheaper and much healthier alternative to dangerous and expensive pharmaceutical drugs. So much so, the US Food and Drug Administration has just allowed the banana industry to make official claims for the fruit's ability to reduce the risk of high blood pressure and stroke. Brain Food: Research has shown that the potassium in bananas boost the function of the brain and improves one's ability to stay focused and learn, especially in children and young adults. Constipation: Bananas are high in water-absorbent fiber creating the bulk necessary to alleviate constipation. Bananas are definitely a healthier choice than over the counter laxatives which have no nutritional value and often contain harsh chemicals. Diarrhea: Eat a ripe banana. Due to its high fiber content it normalizes colonic function in the large intestine by absorbing water which helps ease reduce diarrhea. Ironic isn't it how a banana helps alleviate both diarrhea and constipation? Nature is most wondrous and kind. Energy Booster: The carbohydrate content in bananas is used as fuel for your muscles. Eating bananas is a good safe, nutritious energy booster for athletes. Hangovers: One of the quickest ways of curing a hangover is to make a banana based smoothie, sweetened with honey.. The banana calms the stomach, benefits the function of the brain and, with the help of the honey, builds up depleted blood sugar levels. You can also add orange juice (fresh squeezed preferably), fresh pineapple, and other fruits as well. Heartburn: Bananas have a natural antacid effect in the body, so if you suffer from heartburn, try eating a banana to counteract stomach acidity, it will bring soothing relief. Morning Sickness: Snacking on bananas frequently while pregnant will reduce feelings of nausea. 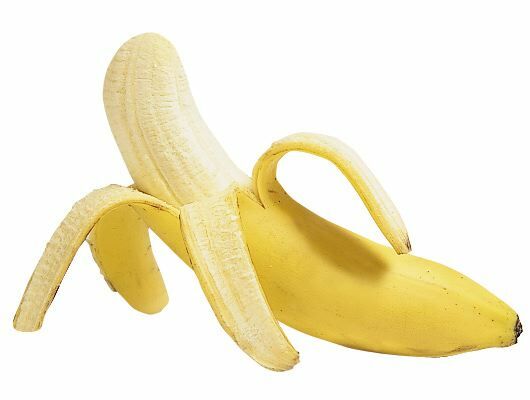 Mosquito bites: When stung by a mosquito, try rubbing the affected area with the inside of a banana skin. It is effective in reducing the swelling and itchiness. Muscle Cramps: A deficiency in potassium can cause muscle cramps and greater susceptibility to injury. So it is definitely in your best interest to make bananas a regular part of your diet if you exercise a lot, both for the energy boost and to prevent cramps and injuries. Smoking Cessation: Vitamins B6 and B12, and the potassium-magnesium combination found in bananas has a profound effect in helping the body recover from nicotine withdrawal when stopping smoking. Stroke: When taken consistently over time, it has also been reported to cut the risk of death by strokes by as much as 40%! So much so, the US Food and Drug Administration has just allowed the banana industry to make official claims for the fruit's ability to reduce the risk of high blood pressure and stroke. Stomach Ulcers: This is the only fruit that a chronic ulcer sufferer can eat without causing distress to the stomach. It neutralizes the over-acidity of the gastric juices and reduces the irritation of the ulcer by coating the stomach lining. Ripe bananas relieve acute symptoms and promote the healing process. Reduces Stress: When we are stressed, adrenalin is released causing body potassium levels to be reduced. By snacking on the potassium-packed banana, Eating Banana helps to re-balance this vital mineral, and helps normalize the heartbeat. This in turn sends oxygen to the brain and helps regulate the body's water balance. So, isn't banana nutrition amazing? A banana really is a natural remedy for many ills. It is one of the best value foods around. Beyond banana nutrition to the practical aspects of banana selection. Bananas are so widely available nearly everywhere on the planet that they don't need much use information. This is one of my favorite fruits since it is readily available, inexpensive, delicious, and most importantly, extremely nutritious. I eat a banana nearly every day because of all of these qualities. There are approximately 300 species of banana. However only about 20 are cultivated commercially. Did you know bananas do not grow on trees, they grow on very large plants which can get so big they look like trees. Bananas come in a variety of sizes from the size of your big toe to the size of your forearm. Most of you know this stuff. 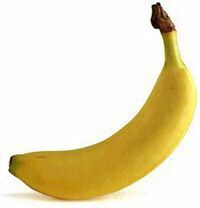 When a banana is ripe, the peel turns yellow. It is easily peeled and may be eaten as it is. The fruit is sweet, and has a soft, smooth texture which is easy to digest. Eat bananas when they are ripe meaning not having many brown spots or being very soft to the touch. There may even be a slight greenish tinge to an almost ripe banana at one or both ends. This is usually when the flavor is the best. Avoid eating unripened bananas because they do not taste as good as when they are ripe or nearly ripe and are more difficult to digest. Keep raw bananas at room temperature so that they can ripen naturally. Don't put them in the refrigerator, if you want them to ripen. While we can't juice bananas we sure can blend them with other fruits in a blender making rich, creamy and delicious fruit smoothies. I can't remember ever eating a smoothie with out putting in one banana. This is the ingredient that makes a Smoothie..."smooth". You just peel the ripe banana and put big chunks of it into your blender...that's the first ingredient I put in my blender to make a smoothie and I build from there, often with a slice of fresh pineapple, then strawberries and then fresh squeezed orange juice if it is available to some high quality pasteurized processed orange juice and often the juice of a fresh squeezed lemon. Click here to return to Healthy and Healing Foods. Click here to return to My Home Page from Banana Nutrition.